"I'm late! I'm late! For a very important date! No time to say hello, goodbye, I'm late, I'm late, I'm late!" I managed to convince one of my friends to cosplay as the Cheshire cat from Alice in Wonderland and I promised him that I would be his white rabbit :) I didn't want to cosplay as Alice because I donèt really like her outfit from the cartoon and her outfits in the latest film are just plain crazy! I mean, I would love to do one of those but I don't have the time or money to go off on a crazy fabric shopping adventure to find the right fabrics! I had also decided that the white rabbit would be a closet cosplay for me as I had come up with an original design for it which would be cheap and easy for me to make. Recently I saw an artwork depicting Alice and I fell in love with her costume! I will eventually do that version of her. I wanted to make my rabbit costume a little odd and punky (steampunky that is!). The accessories and the costume bits are not supposed to match, rather they are supposed to make a jumbled, unfashionable mess! I had played with a few versions of the white rabbit and I still haven't decided what it is going to look like in the end. I guess it will be a surprise even for me! Spontaneity is awesome! Shirt - Originally I made a leotard to go with this costume but I was unhappy with how it looked with the waistcoat. Fortunately I own a really cute white blouse that worked perfectly with the costume! Waistcoat - The pattern for the waist coat was hand drafted by wrapping myself in saran wrap and tape, then drawing the pattern and cutting it off. The pieces were laid flat on some paper to trace the pattern. I added some ease and seam allowances as well as some extra width in the front for the buttons. The tail patterns were improvised using the width in the back as the only measurement. I used a red satin for the lining and a black matte sateen for the outside. The waistcoat was sewn together with the right sides together (lining and outside). I ended up having to slip stitch in the armholes. The buttons were hand sewn and the button holes were done by machine. I didn't really like how it turned out but it was my first time trying to do something like this. Next time I will have to add in some shaping features like darts or princess seams. Skirt - I bought a pleated white skirt at Hot Topic while visiting Toronto last fall. It was super cute and I figured that I would get to wear it during the summer. 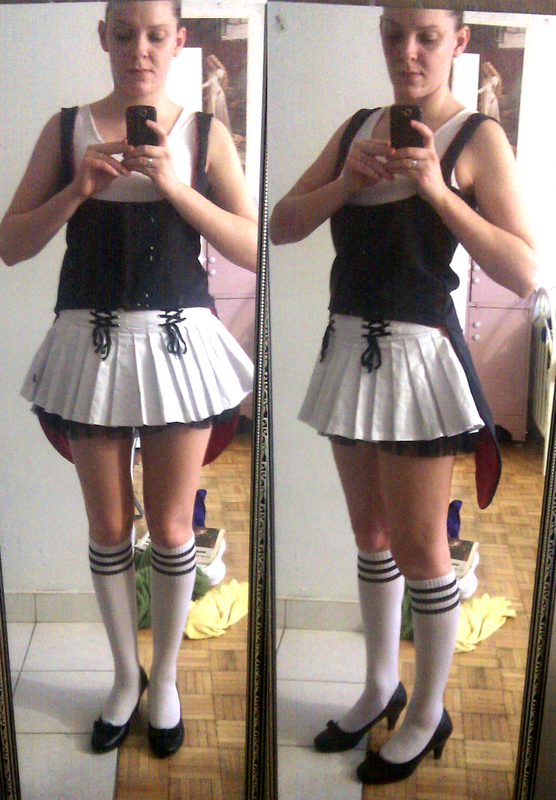 Once I started working on the white rabbit I figured that I could also use the skirt for the cosplay! Ears and Tail - I was talking to my cosplay friend Bandit Spurs about her bunny Bulma ears and asked her how she managed to make them. I was just going to line them with wire and hope they would stay up. She told me that I should use craft foam as a base and then build on that. Taking her advice I cut out craftfoam ears, glued jewelry wire to them on the back, glued pink and white fabric over the base and attached the ears to a thick headband by gluing the excess wire to the band (it was curved to match it). With the wire in the ears I was able to bend them to get that cute half open ear look. The tail was made using a foam ball, glue and the same white fabric I used for the ears. I covered the ball with the fabric and it attaches to the skirt through the tails of the waistcoat with a safety pin. Pocket Watch and Chain - I was going to make a chain link to match my steampunk inspired pocket watch I purchased at a previous con but I was too cheap and lazy to buy the tools and links required. Instead, I opted for a premade chain link which I just attached to the watch and a little loop inside the waist coat pocket. Top Hat - I followed a simple wiki how tutorial for making a cardboard top hat. It consists of fabric covered cardboard glued together to form a top hat. As I wanted to try an add a little steampunkery to my costume I added small clock gears as decoration for the top hat. The hat was then glued to the ear-band. Socks - The socks are knee length socks that were bought at Hot Topic. Shoes - I already own a pair of black pumps so I'm going to use those in this cosplay.